Experience VEGG culinary pop-ups at local venues around Austin. VEGG will be at the 8th annual Texas VegFest this year! Swing by our booth for house-made vegan street food. Entrance to the event is free to the public. Local and national sponsors and vendors, educational lectures, cooking demonstrations, community outreach, a featured nonprofit, youth activities, fantastic food, craft beer, and live music are just a few of the activities Texas VegFest offers for everyone to enjoy! 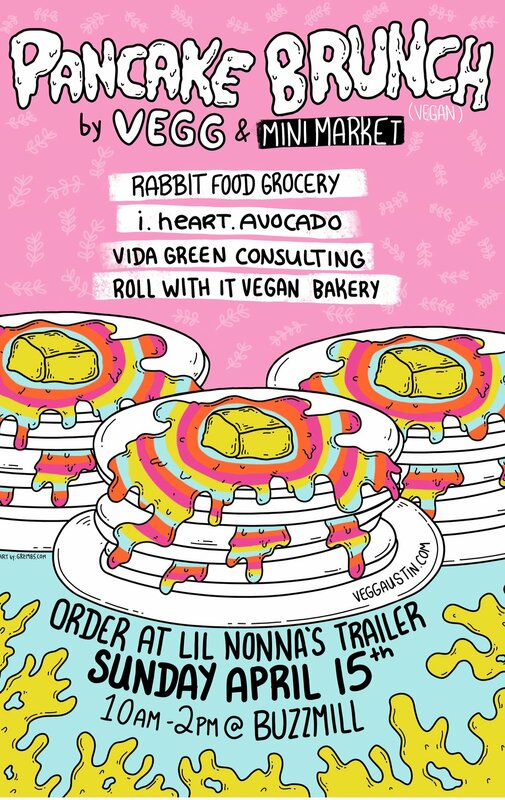 The Wandering Vegan Market is celebrating their two year anniversary. Local vegan vendors and artisans selling food, bath, body and skincare products, make up, jewelry, candles, plants, artwork and much more. Toy and Treat Drive for Paws of Austin. Plant Based Food by VEGG, Curcuma, Hippeaz, Plow Distribution and Capital City Bakery. Come eat, drink and be thankful! 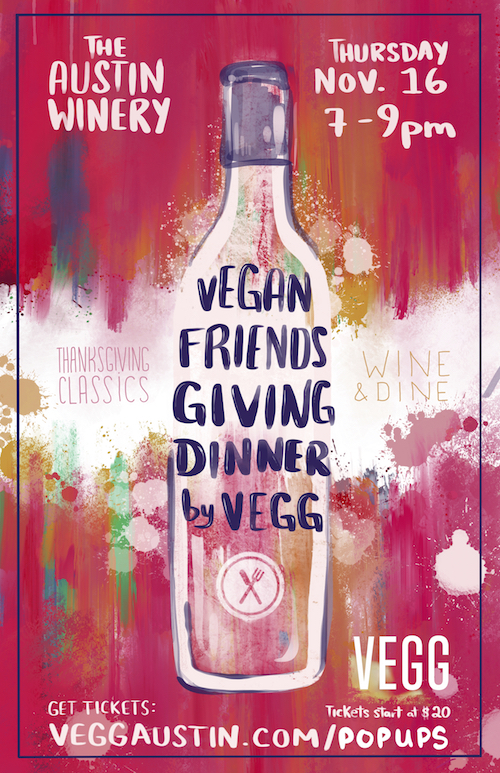 Join VEGG for a classic (vegan) Thanksgiving dinner hosted by The Austin Winery! Doors open at 6pm, dinner buffet served at 7pm. Carpooling encouraged! VEGG is popping up at Vegan Wonder Austin. Vegan Wonder is a large monthly ticketed event featuring a collection of some of Texas’ best plant based food. The event will have delicious food, live music provided by Mike von Paul and Ex Romantika plus hand crafted cocktails by Still. VWA will donate some of the proceeds to Sara's Sanctuary. VEGG will be donating tips from the event to Central Texas Pig Rescue. VEGG is popping up at The Austin Winery! Bring your sweetie or your besties and come enjoy a fun cocktail party with passed (vegan) hors d'oeuvrses by VEGG and wine by The Austin Winery. Included in the ticket price is a glass of wine. Dressy casual attire is encouraged! VEGG will be at the 7th annual Texas VegFest this year! Swing by our tent for house-made sandwiches and drinks. 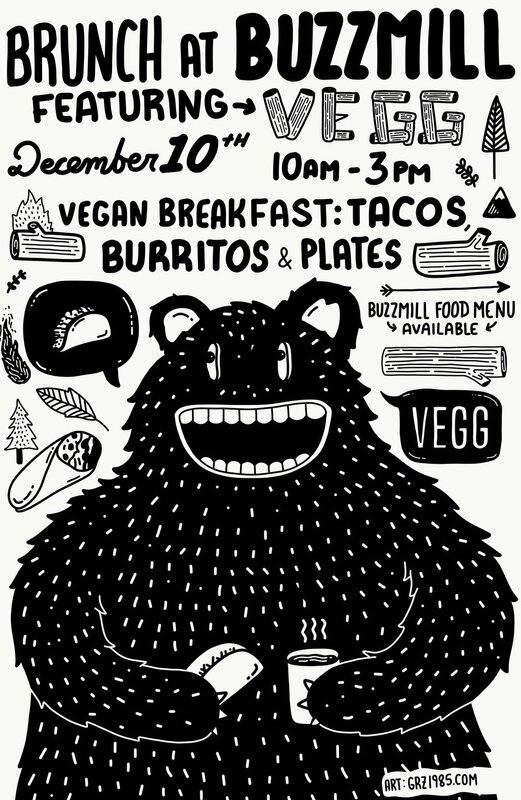 Join VEGG for a Vegan Pancake Brunch and Mini Market at Buzzmill! Nosh on pancakes, sip mimosas and shop Austin's finest vegan vendors all in one place. VEGG be serving out of Li'l Nonna's trailer. Order at the window and we'll deliver your brunch noms right to your table. VEGG is popping up at The Austin Winery! Come enjoy an evening filled with classic Italian (vegan) fare and wine by The Austin Winery. Included in the ticket price is a glass of wine or beverage of your choice + 15% off all wine bottles purchased. Doors open at 6:30pm for antipasto and wine, followed by the buffet at 7pm. VEGG is popping up for Vegan Brunch at Buzzmill! We'll be serving out of Li'l Nonna's trailer. Order at the window and VEGG will deliver your brunch noms right to your table. The Wandering Vegan Market features local vegan artisan products and vegan food vendors. Come celebrate the market's one year anniversary party. 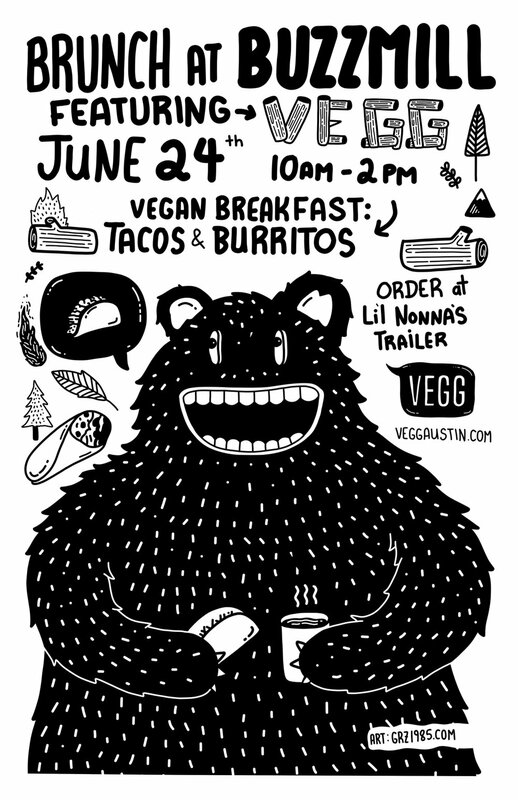 In collaboration with Austin Yoga Meet Up and Camp Gladiator VEGG will be popping up at CG Arena with fully loaded vegan breakfast tacos. 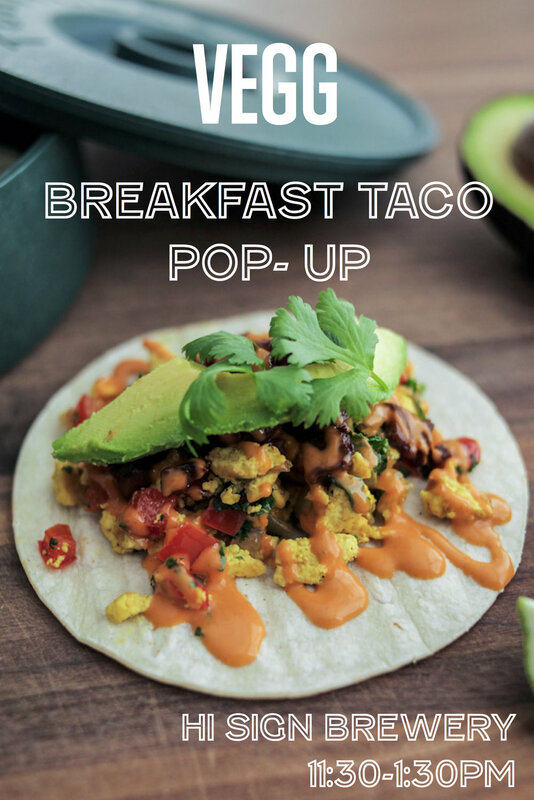 Come for FREE yoga and stay for the breakfast tacos! VEGG is at it again! We're popping up for Vegan Brunch at Buzzmill! To better serve you, this time we'll be serving out of Li'l Nonna's trailer. 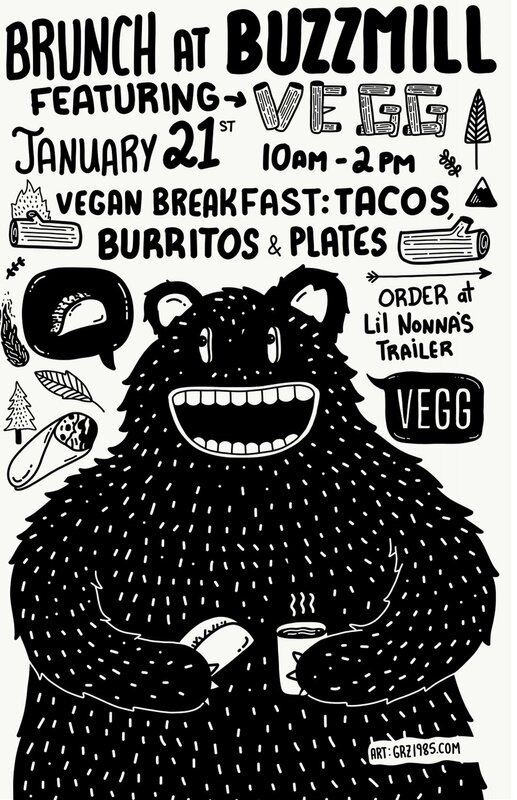 Order at Li'l Nonna's window and VEGG will deliver your brunch noms right to your table. VEGG is popping up for Vegan Brunch at Buzzmill! Order at the bar and your brunch noms will be delivered right to your table. -->This pop-up could become a regular thing if y'all are into it! Come out, eat up and let us know if you want it on the regular. Come wine and dine with VEGG and The Austin Winery! Enjoy a classic (vegan) Thanksgiving dinner and a glass of Austin's finest wine. Come cool off and enjoy a fun-filled Sunday by the pool featuring a pop-up vegan market with food by VEGG, specialty cocktails by Kitty's, and shop goods from local artisans.